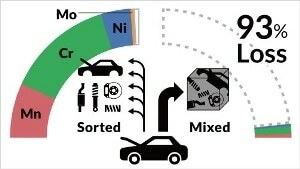 Research conducted by researchers from Tohoku University and their collaborators indicates that, in Japan, recycling rates of alloy elements can be increased to more than 97% by sorting scrap car parts into eight classes. They discovered that through the optimization of recycling, 31.6 billion yen ($287 million USD) can be saved by Japanese steelmakers on raw materials; reducing greenhouse gas emissions related to acquiring new material by over 28%. The study reported in the Environmental Science & Technology journal indicated that as it is obligatory to recycle automobiles in Japan, scrap car parts are generally aggregated together for iron. This indicates that particular alloy elements contained in the scrap (for example chromium, molybdenum, nickel and manganese) are not optimally recycled. The scientists investigated the scrap car parts composition and their reuse purpose, and discovered that they can be optimal for nine steel alloys. The study found that nearly 94%-99% of the alloy elements can be recycled from the scrap car parts. The scrap metal will be melted down inside electric arc furnaces and re-formed into steel products such as plates, coils and bars. Nearly 10% of the new material needed by electric arc furnace (EAF) steelmakers can be substituted by the recycled alloy elements. Although it may seem like a meager portion of the raw material used, it actually leads to huge savings - nearly 15.2% of expenditure on alloys by steelmakers would be saved. The greenhouse gas emissions related to synthesis of the new material is decreased by 28.3%. During the investigations, the scientists compared tradeoffs between cost reduction and emissions. They discovered that a little compromise on costs can lead to nearly the highest reduction in emissions. They could even recognize the recycled alloy elements that greatly contributed to this equation, for the highest possible advantage. The researchers are of the view that this methodology can be used worldwide and also in other industries, thereby making the optimal balance between emissions and costs to optimize the recycling efforts. This methodology will also help advance efforts to establish a circular economy, one that addresses products from cradle to grave and minimizes harmful environmental impacts. Regardless of the prospective savings, the researchers expect that enhancement of car scrap recycling systems will probably need policymakers to back up the creation of innovative automatic sorting techniques for recyclers and also to encourage steelmakers to buy sorted scrap at reasonable prices.